To understand eAsking first you should know what is eAskme and what is EASKER. The eAsking is related to eAskme and EASKERS. The eAskme is the knowledge source of technology and answer of all questions of its visitors and readers. The EASKERS are the followers of eAskme. 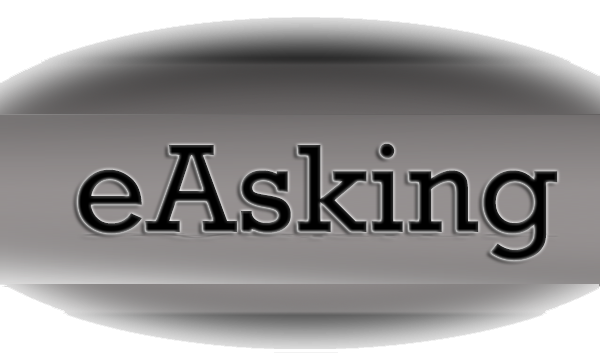 Whenever a visitor or reader or EASKER ask, reply or comment on www.eAskme.com that is known as eAsking. This term is introduced by "eAskme" to differentiate the comments and questions of it`s valuable visitors and also give it a professional touch. Anyone who come on www.eAskme.com can do eAsking. They can ask, comment and reply on comments. Also eAsking includes sharing of knowledge where visitors share their knowledge and issues in comments. eAsking help both the visitors and eAskme to know what issues are coming and what are their answers. In short eAsking is commenting on posts, asking questions and sharing knowledge. So next time when you comment on eAskme, give it value and call it eAsking.